We used to have packages sent several times a year to us in Richmond ,Va. Thanks for the comment. The reach of this food is very impressive. Was it the Ring or the cervelat or what else did you order? If any of you are out on Long Island, N.Y. in Huntington. Forest Pork Store makes cervelat that in my opinion is a carbon copy of that richly smokey cervelat from Bloch and Falk. They also have all the old favorites, teawurst, blutwurst, liverwurst, baloney, etc. I think many of their items are better than Shaller and Weber, although they are also very good. A pork store can’t be Jewish or kosher. Where can I find the veal baloney that we used to buy at Bloch and Falk in the 1950s and 60s? Thank you for your astute comment that pork cannot be Kosher. However I don’t recall that I said Forrest Pork Store was Kosher or Jewish. Do you believe that every Bloch and Falk customer was Kosher? I don’t think so. In any case good luck with your search. No, of course I’m sure that not every Bloch and Falk customer was Jewish or German or Kosher, but weren’t all of the products Kosher? By the way, I don’t need kosher, but the veal baloney I remember was so mild and delicious. Also as I read through the comments before mine, I can reminisce about my life in Washington Heights: P.S. 187, GWHS, and in 1962 the summer after I graduated from high school, I also went to Camp Pine Cone. You might want to contact Wasserman & Lemberger in Baltimore. Reading through the thread of Blogs, I note that they made veal aufschnitt products at one time. They are also Kosher from what I read. Who knows! Perhaps they can also ship. My father and I went on Thursdays to buy the meat products for the week. Luckily we only lived 3blocks away. I remember Alfred would cut a small piece of Landeager for me to eat. They were two pieces connected in the middle. We bought four at one time. The cold cuts neatly were stacked behind a plexiglass wall for all the patrons to see. Just walking in the place was an experience. The smell of all the mixture of different kinds of meats was amazing. It was definitely a pleasurable experience and one that will be missed. At the risk of being removed from this blog, I have to tell you that after years of hunting the only sausage I found closest to Bloch and Falk is not Kosher, and I get it at Forest Pork Store in Huntington, N.Y. They make it themselves. They either slice it from large loaves or sell it in one pound bullets. We live in Florida. Other than during XMAS, they ship to Florida. The shipping is not cheap. The bullets cost about $10/ each. After moving to Richmond, VA, my father used to travel to NYC on business every few weeks and brough back all our favorites from Bloch & Falk. My mouth waters just thinking about it. Now that I live in Westchester County, it would be so easy to get to Manhattan to buy our fill of Aufschnitt. Hello, Sonya. Among my favorites: Rauchfleisch, Cervelat, Thüringer Landwurst, Leberwurst, Fleischwurst, Knackwurst. There were others, but those come to mind, after all these years. Are there “real” substitues? Wow, what a long list of favorites, thanks Paul! I assume you are asking a rhetorical question — I don’t know if there are any ‘real’ substitutes. I assume not, but I was wondering if you knew of anything that comes close. Or anything you eat instead. I think it’s an interesting idea to think about recreating these original Wursts and Aufschnitts, since so many people have such incredible memories of eating them! I started at Bloch and Falk in the 80’s and we carry some of the goodies they used to. We absolutely have everything in raw meat. We absolutely have everything and more in the raw product line. By more I mean goose, foie gras, quail, pheasent, wild ducks, bison and venison besides all of the usual. In the cold cuts we sell cervelat, pepperoni, Hungarian salami, turkey bacon, lamb bacon and beef fry, etc. I would really be interestes, if there is someone out there whom would like to share the recipes in producing some of the Old time products that you can’t find anywhere anymore, talking strictly kosher. Paul–do you have red hair and lived on 162 St. at one time??? Yes, I still have red hair, although there is gray mixed in now., and yes, I lived on 162 St. I cannot believe you remember that. Where are you now? Hi Sonya. Here is a comment I sent to your mother — which she urged me to adapt for the blog. Of course my mother, too, bought sausage, salamis and ring wurst there as well. I especially liked the ring wurst (I think that is the right name), a spicy dark red sausage bent into a ring with ends tied with string. You enjoyed yours with lentil soup; we had split pea (Campbell’s). I added croutons in later years whenever I cooked this for myself. Really loved it until I began to fret over the fat content. Used to buy it for my parents in Florida almost every time I visited — until the shop closed, and then found similar items in Schaller & Weber (NYC). I also remember well how Stephan (your grandfather) loved small spicy frankfurters, with sharp mustard. I am reminded how nicely he and your grandmother treated me to many a dinner in Englewood, NJ, in the 60s, 70s and 80s, if I remember the dates correctly. Every three or four months or so. And for the longest time Stephan would profer me a cigar after dinner, and an aquavit, a Swedish liqueur that my father was fond of as well. Thanks for sharing you memories of wurst (and Opa’s offerings of cigars and Aquavit)! thoroughly enjoyed reading about Bloch & Falk brings back memories (Good). Wish we could find a place to buy all those good things . Thanks for writing Susan! Glad you enjoyed reading the post, and that it evoked good memories. I’m wondering…what were the types of things you bought at Bloch & Falk? Which were your favorites? This is Marion Bloch, regards from my mom, Herta. We are just sitting here at home reading all of the comments about her and my father’s business. To Susan Pfeiffer Plaut: Did you live at 162 St & B’way? Was your father’s name Julius? To Susan Pfeiffer Plaut: Further to my earlier question, was your mother’s name Rita, and di you have a sister, Edith, who moved to Baltimore? Your dad used to play cards with my dad. The absolute best…I grew up eating their wurst and cold cuts. The German-Jewish answer to soul food. You can get freshly made cervelat wurst at Wasserman and Limberger, a kosher butcher in Baltimore MD. I believe the owners are Swiss. That was my father’s store, Wasserman and Lemberger. My dad used to make veal aufschnit, corned beef aufschnit, tongue aufschnit and I remember helping him. He used to get nice size orders from Bloch and Falk and Kestrich( not right spelling). I used to pick up the boxes from the Greyhound station in downtown Baltimore. What a great memory,having the station wagon smell of ceverlats and other sausages and salamis. My father passed away in 1986 and Mr. Lemberger sold the store in 1992 to Mr. Ari Benjamin from Switzerland. he is the son of a sausage maker in Switzerland and now makes some of the best aufgschnit,hot dogs,cold cuts and other meat delicacies. Defintely worth a trip to this store. I love the way things are coming full circle with Wasserman and Lemberger as a focal point, a store that today has a direct connection back to Bloch and Falk and makes a highly recommended contemporary product. Thank you Howard for putting it all together and Alfred for contributing your memories to the story as well. Bloch & Falk, Polk 133th Street and Schaller & Weber. When ever I would have a package to take up to the mountains I always got somethin as a tip from all to the companys I serviced. Of course both my parents and I alway bought meat from Bloch & Falk because that was so near to we lived. Now one other thing I had to relatives who worked for Bloch & Falk. One was Bert Strauss who went onto to become a butcher in Calforina and ended up Vice Preisdent of Freade Stores. The other was Berni Waserman who opened Wasserman & Limberger. They got there Cold Cuts from Bloch & Falk for years. While I was stationed at Camp Lejune in N.C. I often drove down an when I went thru Baltimore I often had big orders to carry down. Years later they made thgere own Cold Cuts. By te way as an aside when I was 16 years old mym sister and my cousine Hedy Loeb Wasserman (Bernies wife) got engaged my father made a party for them at resturaunt on 57th street in New York. I was introduced there to Aquavit,and to this day I have a bottle in my freezer both in my home in Pearl River and in Florida. I wish I could find the kind of meats and service we all got back in the old days. By the way the wurst in the station in Fraanfort is very could. My name is Karl Hess, and I live in West Nyack, NY. I have fond memories of Bloch and Falk. My mother, Melitta and my dad, Oscar, always bought their cervelat and aufschnitt at B&F for our Sunday night suppers. My dad, a painter, painted their store. I am happy to hear that Herta is still alive and “kicking.” I always loved the samples I got. Such very fond memories especially of the smoked lever wurst. We would buy extras and freeze one for the times that the craving overcame us. Miss koesterich, as well. Nothing in NJ compares. I remember it well. My father would go there and shop and my mother would worry if she had enough space in her refrigerator (known as an ice box even without the old fashioned ice) for his over purchase of cold cuts. I still remember the taste of the cervelat wurst and the leber wurst. Loved to eat them together. 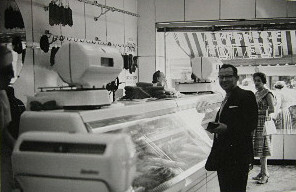 We were friends with Charlie Wertheim, another Bloch and Falk butcher! I think the Charlie you refer to delivered B&F to our house in Fair Lawn.NJ. Rothschild family. The only salami I could ever eat. Delivered Baloney, Turkey wurst, brat wurst, tungue, hot dogs, and I’m sure other goodies I can’t remember. What was the name of the youngish — tatooed — butcher who worked at B&F in the early 80s? Wondering if he’s still in the wurst business. I forgot about the liver wurst & olive baloney. BEST. Oh2,How I Miss my usual trip to Bloch and Falk every Sunday.My son used to deliver orders from Riverdale and used to get samples which were his joy. They made something called landtwurst. It was a ring and my mother boiled it, even though I think it was smoked enough to eat raw. I was never able to find again. It went great with German kartuffel salad. Any ideas where it can be gotten today or what it is really named? Your nectar really is at Wasserman and Lemberger in Baltimore. He does not ship out of state,but he makes a lot of different cold cuts,aufschnit, hot dogs,pickled turkey breast, landjaegers, jerkys, biltong,cervelat, and more. Where is Wasserman & Lemberger? We have lots of relatives in Baltimore and I will be going to Washington in November. They had the best of all the German Jewish butcher stores in Washington Heights. Herta greeted everyone by name and a big smile. Glad to read she is doing well at 92. A great article and comments. My mother Beate knows Herta and sees her at synagogue. Beate was a salesperson at the Alpine bake shoppe a few blocks away. Herta would buy bread there for sandwiches. I have fond memories of shopping at B&F and relished the cervelat.. something that I can’t get anymore. One of my college friends Larry N. used to work there and he would say there is nothing like the taste of fresh made wurst.! Today, even at this hour, my mother retains in her basement freezer vacuum-sealed olive loaf, paper-wrapped gans leberwurst, and schwademagge purchased at Bloch and Falk in the very early Nineties, before Herr Bloch sold it to the Israelis without the recipes. Although the remains are almost certainly inedible, she was hoping someday to do gas chromatography of the petrified forcemeats, so that the spice mixtures Herr Bloch used, in an empty shop with all of his employees chased away, could be reconstructed. Here in Forest Hills, we made friends with Fred and MIllie Lauchheimer, who owned the B&F outlet off of Austin St., but Fred didn’t have an inkling of Herr Bloch’s knowledge. One of Herr Bloch’s trainee butchers has Aaron’s Gourmet, in Rego Park, where the fleisch is very good – but, again he doesn’t try too often to make the old wurstschen, because he can’t ensure the same predictable output everytime he sets up. His frankfurters are very good, and he does a very nice corned beef. If anyone is ever out near Huntington, LI. and Kosher is not a deal breaker, try the Cervelat at Forest Pork Store on Jericho Turnpike. Get the wider one without the peppercorns. I think it is very close to the B&F ? They also have great Goose Liverwurst and teawurst( coarse and fine). I even have it shipped to Florida in the winter. Going on Sundays to Bloch & Falk was a tradition in our family. My greatest joy as a child to walk in there and have Uncle Alfred wave in to the back of the store. He would reach in a large paper bag, grab a nice fresh roll, cut it in half, and then walk me behind the counter asking what I would like! Whatever I asked for he laid in that roll, to a thickness wider than my eyes could open! One of my favorites was something he had called beef fry. Since bacon was a no-no, this was the substitute, and 100 times better. Later on when I moved to Florida (for 2 years) I would get a package almost every month. They came from Uncle Alfred, packed with love and meats to make me not miss my Sunday’s back home. I recently was talking about this with my mother and found out to my surprise, her and my father had no knowledge of Alfred doing this. Well, I do have other wonderful memories of Alfred and the family, but keeping to the story none so profoundly as my childhood with my personal butcher who had the best stuff in the world. Show your mom this blog site, she will love it! I, too, remember going to Bloch and Falk on Sundays to get aufshnitt, cervelat, liver wurst, land jaeger, etc. it wasn’t Sunday without aufshnit. When the branch was opened in Forest Hills, it became a ritual and even my children remember the aufshnit and Bloch and Falk. There is nothing like this today, but I think price would be no object if someone could recapture the recipes. I continue to be kosher so this would be a novelty today. Abeles and Heyman makes liver wurst and cervelat that is similar but not exactly the same. Anything close for déjà vu! It was great reading this article. I just saw Herta recently during the summer. My father Walter Marx and my mother Elsie Marx were partners in the business. (They became partners in the store after the Falk family sold their share). I remember walking from PS 173 to my father’s store for lunch. I ate a lot of meat then and have become a vegetarian in recent years. I went to Camp Pine Cone and my parents sent us salami and landjaegers. All of my bunkmates loved the meats. 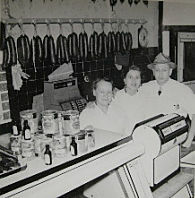 My adult kids as well as a lot of previous customers would like to find a place that sells Bloch and Falk wurst. I think I remember you. I went to P S 173, JHS 115 and George Washington H .S. Reading your comments rattled my brain to remembering you. Where do you live now? We live in NJ for many years. Retired and busy, but still love the tastes of Bloch and Falk. I can still smell the salamis in our bunk. I remember always getting a slice of bologna when in the store and to this day can still taste the landjaeger. Are they still sold anywhere? Also a Washington Heights girl and graduate of GWHS. Camp Pine Cone? That brings back memories. I was there in 1962, the summer after I graduated from GWHS. My cousin was there, I think, 15 years before that after she graduated from GWHS. I think Milt Fine was the head counselor when I was there. He became a principal in Riverdale much later. I forgot the director’s name. I think I do remember the resident rabbi Landsman and his wife Mindy. I grew up across the street from Bloch & Falk. We used to go there all the time. Really happy to find this online. Your mom must be so happy to read all the comments and that so many remember Bloch and Falk. Reading about the store and the delicacies brought back both my husband’s memories and mine. I’m sure your mom would remember Ruth Sanders ( my mother in law) and my mom Anna Wolff. We and they were regulars. Give our best to your mom. Was just looking over the comments on the Bloch & Falk blog and your name rang a bell – both for me and for my husband. I was Yvonne Heumann on 171st Street and married Rene Daniel from Ft Washington Ave & 171st Street. Didn’t you live right on the corner of 171st and Ft Wash? We’re married almost 50 years and live in Baltimore. Would love to hear from you if you remember us………. Contrary to all of you my brother and I grew up on Pollack cervelatwurst and other aufschnitt. When they went out of business we switched to Schaller and Weber. They are the lone survivors and we still enjoy it today. My children grew up with it and now my four grandchildren.and various in-laws that married in, do too. They have a retail store on 86th street. In New York you can buy it at Fairway and Zabar’s. Anywhere in the USA you can buy it at http://www.germandeli.com. They are located in Texas, believe it or not! My daughter, who lives on Mercer Island outside of Seattle, found cervelatwurst and other German delights at an Alpine deli within walking distance ( unfortunately now closed), it’s out there if you want it – and just as good. But Schaller and Weber products are treif and I think most followers on this blog didn’t eat that in the past or now. I know it is not Kosher and not for everyone, just another alternative. I used to go to Pollack under the Riverside Drive overpass near 125th St. I sorely miss those places. There were several competitors to B&F in the 1940’s and ’50’s. There was Koesterich and Schild in addition to Pollack, however B&F was the most popular. Well Howard, I still don’t eat trief, but it seems that most folks on this blog do. Good Day.My name me is Fred Strauss whose mother was known as “die Frau Strauss aus der Gartenstrasse” from Frankfurt. In the US, she last lived on Ft. Washington Ave. When my parents were first wed in 1922, my mother bought her meat from B&F on the Zeil. I remembered as a long store and they seved “heise wuerstchen: on a roll in the front of the store. When we both (my Parents & the Bloch & Falk families came to the US, we became customers as well as friends again. When B& F closed their Washington Hts. store, we continued to buy from “lolly pop” Lauchheimer in Forest Hills but now are without the famous aufschnitt. Sine I donate it treff, per se, we used to buy veal wuerstchen From Schaller and Weber but that is not available anymore. I did find glatt kosher Servelat wurst at the Glatt Kosher Food Market in Lawrence here on Long Island whic is made by a buthcher in the Bronx. My family, especially my middle aged children remembered the real B&F aufschnitt which conisted of meat scraps which were smoked. My mouth waters everytime I think of that. They also had the most delicious veal roasts. My wife cannot duplicate my mother’s receipe. Anyway, we had to settle for non-kosher Sabrett franks. Please send our regards to your mother. I am sure that she remembers us. My eMail address is fskbassoc@aol.com. My parents were both from Germany. My Dad and my mothers father my Opa both mad cervelat and raunch fleisch. I have the sausage maker tat my Opa brought from Frankfurt. I also have recipes fo making cervelat Rauchfleisch and other sausages. All beef. I am from Chicago. Renee, I would love to get your recipes. My wife and I are working to duplicate the aufschnitt we grew with. I especially miss lundjeiger (spelling?) and shmearwurst. Funny, our separate families were both customers of Schild Brothers and Abeles and Heiman – still buy the A&B franks (they are the best) as well as their cervelat and liverwurst! Please try to reach me offline if you wish david -dot- awerbuch -at- gmail -dot- com. I think that you should post those recipes!! This Blog is turning out to be the Facebook of old Washington Heights and Inwood. How fortunate for all of us and who knows, could it also be that Bloch & Falk was the Starbucks of its day in our old neighborhood…a place where our parents all seemed to have gathered for something that we all really enjoyed. Cervelatwurst then, a bold Cafe Verona now. My husband now brings home an occasional pound of sliced Shaller and Weber Beef Cervelat (together with a Marzipan treat). It is the closest wurst to the real thing produced by Bloch & Falk. Do you now live in Riverdale in Apt. 11-0 and with husband Irv? Hi from 11-L. Didn’t know you were from the Heights. I grew up in Washington Heights and my Oma shopped weekly at Bloch & Falk for her family and neighbors. In 1977 my other Oma gave me the cookbook “Recipes Remembered, German-Jewish specialties” compiled by the sisterhood of Congregation Habonim in NYC (1976). I use the recipes in the book for my Passover Hazelnut-cake and matzoh balls (made from whole matzohs, crushed) just like Oma made. – Glad I found this blog. I was Bar mitzvahed by Rabbi Hahn of Habonim when they still didn’t have a synagogue and rotated between NYC and Elmhurst. Of course that was 1954. Would it be possible to get a copy of the recipe book you refer to? My wife and I would one to see it. I contacted congregation Habonim about what appears to be a great interest in the 1976 recipe book, many in my family are also interested in copies. Habonim is preparing for a November celebration of their 75th anniversary and will consider my request to recreate the origianl Recipes Remembered. We would be very interested in recreating some, if not all of the fine products Bloch and Falk used to carry. Alex. That sounds wonderful, please keep us posted on your progress of reproducing Recipes Remembered!! I think it is amazing and wonderful how much interest there is in the Washington Heights nostalgia and especially the wonderful “wurst” memories. In the absence of definite progress on the cookbook, I was wondering if photocopies could be made of the original. I certainly would be willing to pay Kinkos to make copies if someone volunteered the original. If anybody has any further thoughts on the matter, please speak up. Is the book very big or could it be scanned? I still have recipe cards from my mother that I could contribute if I can read them. If someone would mail me the book, I would scan it and return to sender. We do not have a copy of the book, only a photocopy. I suggest looking for a copy at a library that you could scan or copy! If you are in the NYC area, I believe there is a copy at the main branch of NY Public Library (in addition to the Center for Jewish History that I mentioned previously). Remember Bloch & Falk so well. My Mother Lisa was a caterer for Beth Hillel and she often get the cold cuts(aufschnitt) from the store. I am a decades long vegetarian but some of the memories for these thinly sliced pieces of Kalbsaufshnitt still makes my mouth water. Regards to family members of this store. If Richard Bloch reads this and remembers me give ma holler, here in Oakland CA. So sorry to tell you that Richard passed away in December. A big hello to Herta from Sandy Jacoby! I have fond memories of you at the store. And you did many kind things for me when I was a kid. Also hello to Marion, Richard, and Andrew. The best part of the store was having Alfred give you a big smile while he bustled about in his white coat. I happened to be fond of sulze. My meatcutter uncle would make his own, preparing it in a bowl. Then he’d flip the bowl over and the gelatinous hemisphere would fall out. I yearn for the foods of my childhood. There isn’t much available in Los Angeles and of course it’s treif (though that hasn’t stopped me). If anyone wants to make me a meal (and a deal)…..
By the way, Im a Pine Cone alumnus, 1962-1967. As some of you may know, Marty Schwartzschild passed away a few years ago. Somewhere I have some recipes written in my grandmother’s indecipherable script. I will pass on my information on to my mom. I just wanted anyone who reads this blog to know that my brother Richard passed away in December. There was a youngish man who worked in the shop in the early-mid 1980s who knew how to make wurst. Do you know his name and whether he could teach me how to make wurst? Right! The name was Marty Schwartzschild. Wasn’t his dad a doctor? Pine Cone 1962-1967. How old were you then? I was almost 18 (in ’62). I remember as a little girl going into Bloch and Falk with my mother and getting a sample of aufsnitt every time. My mouth waters thinking of the Rauschfleish and cevalat. My father knew the Blochs from Beth Hillel. Regards to Herta. Thanks, I will pass on your hello to my mom. My family owned a butcher shop on Third Ave in Manhattan called Carl Kaufman and Sons…from the early 1900’s to the 1950’s…unrelated to this, though wondering if anyone is familiar with it. However…I grew up in Queens and went to the Bloch and Falk on Austin St. and my uncle Jake Weinberg worked there. I remember being about 3 years old…and Jake driving up to our house in Kew Gardens Hills in his blue Plymouth, opening the trunk of the car, and before bringing the cold cuts to my mother, he peeled off a couple of slices of baloney for me…though like the others, I have great memories of the cervelat wurst. mattp707, What a wonderful memory, thanks for sharing it! Hi Marion I am so sorry to hear about your brother Richard. Hopefully he lived a happy and fulfilled yet short life. My condolences to you and of course to your Mother. Danny W.
Thanks, I will pass on your condolences to our mom. To Susan Pfeiffer Plaut. I tried to contact you you back in September when you placed a comment, to try to find out whether your parents’ names were Julius and Rita. They were good friends of parents, Otto and Martha, and we also lived on 162nd St, but on the west side of Broadway. I remember you had a younger sister, Edith who moved to Baltimore. your memory is correct. Iremember your parents very well.Your mother was beautify,and she made me up for a play in hebrew school.where do live,we live in yonkers. It is nice to hear from you. Hello Susan….we are practically neighbors, since we live in White Plains. Perhaps we can get together some time to “catch up” on the past 65+ years? Somebody should set up a Bloch & Falk Reunion here in NY. Well if someone does, please let me know and I will let my mother know! Would love a Washington heights reunion. There’s a very nice Marriott in Teaneck. Who likes the idea and wants to be the commander in chief to pull it together? Fond memories of the Bloch and Falk scene which was adjacent to my cousin’s Kosher butcher, Koesterich. Whenever shopping I used to buy the hard German salami at my cousins and sneak next door to Bloch and Falk’s for smoked liverwurst, other goodies and, of course, that slice of delicious bologna impregnated with pistachio nut slices. Hmmmmmm. But alas, you can’t eat memories! Even if we could it would be impossible to reproduce the scene. However, seeing people from the neighborhood and sharing folk law of the Heights from the B&F heyday is something Irv, I would enjoy as well. I’ll come, just knock on my door. A Washington Heights reunion sounds like fun! Let’s plan one. 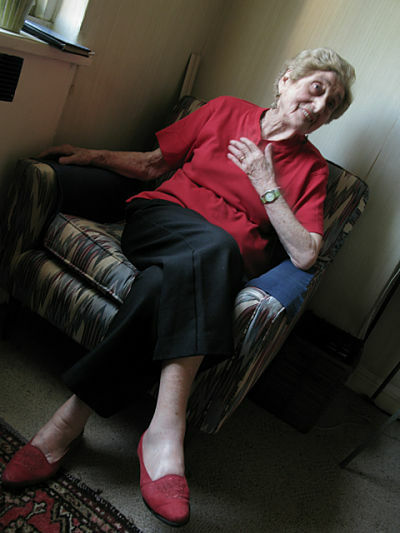 How can I get in touch with Herta Bloch. My parents were long time customers, from 1922, for their meats and sausage. Sorry, Freddy. I don’t know who Herta Bloch is, and of course no idea how to get in touch with her. By the way, I think I may have been the one to start this blog(?) when I asked about Bloch and Falk in the first place. I wanted to find the very mild veal baloney that I remember from my childhood 1950s +. Hi Freddy, I sent you an email after you sent the letter to my mom. I never heard back from you! Thanks for you vivid recollections of lunch, Lenny! Hi, I will pass on your condolences to my mother. Both my husband and I are from Washington Heights (171st Street) and have only fond memories of Bloch & Falk and the entire Heights experience. We have been married for 48 years and live in Baltimore. A number of years ago I went on a bus trip with my shul’s Sisterhood accompanied by our Rabbi. I happened to mention “aufsnit” to him and he made the bus driver go into the Heights, went into the store, and brought “aufsnit” on board for all to share. So sorry we can no longer do that. If a Heights reunion ever happens please find a way to post it. Thanks for the bus story, Yvonne, sounds like a really fun + tasty road trip! Hi Yvonne, I think I remember you from GWHS, and did we also work together at PS 123? I also remember your husband’s name is Rene. Right? I still (now) live in NYC (Bayside Queens) but spent 15 years in Japan. What was your maiden name? I went to PS 173 and taught at a school in Harlem. You were right about my husband’s name. We’re living ib Baltimore. I was Marleen Donath (now Rothstein). Did you go to 173 with Bernice (Kaver) Frisch? We are still in touch after these many years. I still have my GW yearbook and found your and Bernice’s pictures. You both look familiar now that I look at the pictures. Which Junior High did you go to? To Yvonne; I didn’t go to junior high. P.S. 187 was an 8th grade school then, so I entered GW in Sept. 1958. Hey cuz! Fondly remembering the rauchfleisch, gaense leberwurst, teawurst & smearwurst! People on this thread are sayin’ there’s a decent place down in Baltimore- Wasserman & Lemberger. Ever try it? Hi Joel, I am aware of Wasserman & Lemberger but have never been there.It is located not far from me and I will now make it my business to check it out and then post what I find. Isn’t this “blog” interesting? You never know who might pop up! Love to all……..
Great to see all this banter about B&F! The store was started by my grandfather (Falk) and his brother-in-law (I believe that’s the family connection!) in Frankfurt, and then they brought the store to NYC. The rest is history–and lots of bologna with pistachio nuts! Wow, thanks for stopping by Stewart! This was a great place. I wish Rockland County had a butcher shop like this!!! I certainly remember the good old days. This was a trip down memory lane! My name is Judy and my mom, Dorrit Rosenstein, used to be friend of Herta. I was always greeted with her terrific smile. I hope that she is well. Do you have a brother, Peter I think is his name? Was your mom friends of the Scheiners – June, her parents Arthur and Greta? Also my mom’s friend – (Sophie Donath)? Hi, I live in Cleveland Ohio and I’m unable to find all beef liverwurst in this area please direct me to a store in the Cleveland or surrounding area. Bloch and Falk had a second store on Nagle Ave in Inwood. That is the one I remember. My parents (Hilde and Arnold Saemann (German Jewish refugees) shopped there all the time. I always remember getting a piece of aufsnitt as a child when we went into the store. After I moved to Boston my parents used to send me care packages from Bloch and Falk. It was by far the best aufsnitt und wurst I have ever had. Surprised that no one has mentioned the B&F location at Austin Street in Forest Hills. Or the bakery located across the street in Manhattan that made a delicious Hungarian Rye that complemented the cold cuts. I have a sad memory associated with Bloch & Falk. My grandmother, who made the subway trek from Coney Island (we took turns), loaded up on provisions, went to the 168 Street station, sat on a bench to wait for the train and passed away on the spot. Sitting there for hours undisturbed, my mother and grandfather went to get her and brought home the delicacies, still fresh. It was the only time I had no appetite. this is a wonderful blog,,, Marion, my parents Leonore and Rudolf Rothschild and my brother and I lived around the corner on Ft. Washington Avenue and my father went there every week to pick up meats , even after we moved to 187th street , of course I remember your mother, give her my regards.. does she remember us? Unfortunately my parents have passed away and I do not visit the Heights as much anymore . And of course I remember aufshnit. so these memories are more poignant…. My family always went to Bloch & Falk. Does anyone remember Julius Samuel & the Eichtersheimer family & also Rabbi Koppel of Emes Wozedek? went to school with judy eichtersheimer….remember her at rosegarden hotel swimming pool in a bathing suit when my family and I were there when I was about 12….guys were flocking around her like pigeons…asked my mother why and she smiled and said don’t worry about it…guess they thought she was a jewish dolly parton…”who knew”? I am the nephew of rabbi koppel. It’s so nice getting your response. I’m going to let Judy know. There most definitely is a need. My family used to order Bloch & Falk and have it shipped to Oklahoma and Texas. Now we order elsewhere, but it is never as good as Bloch & Falk. Missing all those delectable provisions!! I have both the cookbooks – the original and the more recipes remembered. I am curious which cookbooks you have when you say you have “both”? Is one of them Recipes Remembered, from Habonim? And what is the other? It would be very interesting for us to know which cookbooks are out there! If anyone is interested, with some of your input and recipes, we can try and reproduce some of the products in our New York store after Passover. Bloch and Falk was the largest producer in the world of kosher beef and veal processed into meat products that had taste and texture like very specialized pork products. They produced kosher versions of Proscuitto, mortadella, landgerer, lebanon balogna, and on and on. A few kosher butchers in Paris produce similar products, but nowhere near as much as Bloch and Falk did. In 1986 or so, the widow of the owner sold the business to the highest bidder — a Russian Jew who paid her a large cash deposit and agreed to pay her monthly for several years for the rest. The new owner kicked out the federal and state meat inspectors who came by to check things out. The firm lost all its licenses and closed. The widow never received full payment for the note. This was a small meat plant on upper Broadway that had licensing for delivery anywhere in the USA and any where in the world. No other small meat plant in the world produced as many unique items with licensing for national and international distribution. 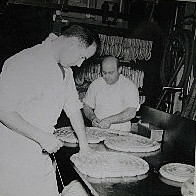 Usually only big plants with hundreds of employees that operate 24 hours a day obtain licensing like Bloch and Falk had. Less than 20 people worked on each shift at Bloch and Falk. What an amazing discovery! My son found this page as we were discussing your wares. My names is Fritzi Kohlhagen Thorner. We lived in Prospect Heights Brooklyn but made regular pilgrimages to Bloch & Falk. I can still see smell & taste everything today. My mom, Meta Kohlhagen, loved the Cervelat, My Dad, Dr. Gustav Kohlhagen loved the Rauchfleish. We all adored the aufschnit especially the ones with tongue and pistachio. My personal favorite was smoke goose liver sausage and weisswurst. Our daughter adored Landjaeger. We purchased huge platters for all our parties. I now live in Naples,Fl. and have fond memories of our train rides up to the Heights. What a thriving German Jewish refugee community there was. I would love to know who is still alive out there & where they now live. How I wish these items were available today. Mrs. Bloch was a amazing, great, and sweet lady, personally knew and worked with her. Thanks, Lenny. I hope that people who read this blog would see. On behalf of the Strauss Family, formerly Gartenstrasse in Frankfurt, please accept our heartfelt condolences. Our family had been customers from the year my parents were married in 1922. My mother was always referred to as “die Frau Strauss aus der Gartenstrasse”, even here in Washington Heights. So sorry to learn about your mom. I lived in Washington Heights until I got married in 1964. The smoked liver wurst was my favorite. Bloch and Falk was our mainstay. When I married Roy Sanders who also lived in Washington heights, our parents brought the liver wurst to NC where we lived for a few years. We live in NJ and we will never find the goodies again. I always used to go to Bloch and Falk with my Omi, Selma Stern. When I was little girl I was offered a free sample of my choice. As I grew older my grandmother thought it wasn’t appropriate for me to accept these samples. She said, “Caroline, next time you are offered wurst you are not allowed to take it.” So next time we went in and I was asked if I would like a sample I replied, “My Omi thinks I’m too old to accept your wurst; but she said nothing about aufschnitt.” Everyone had a good laugh and I got my sample. My mother, Hannibal Marx, picked up orders for years once we moved to Long Island. Please change my mother’s name to Hanni. Thanks! Please change my mother’s name from ‘Hannibal’to ‘Hanni’..thanks! Caroline, Was your Omi married to Julius? Any connection to Stern’s Electrical on 163rd St. and Broadway? My family loved Bloch & Falk, and my brother and I still miss it! 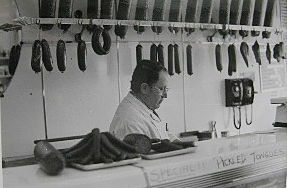 My father, Fred Hess, adored the raufleisch, and we all loved the cervelat, ring sausage (perfect for pea soup), amazing liverwurst, and cold cuts — especially those with with pistachio bits. My dad also liked knorpel (?) — something to do with connective tissue — not sure about this. My father’s family all lived in “the heights” and shopped there. We lived in the Bronx near my mother’s family, and always went to Bloch & Falk when we visited relatives in the neighborhood. And who remembers gruenkern, used in soup, which the store sold. Guerkern and ring sausage. The memory brings tears to my eyes. I grew up in Washington Heights and my mom’s family, the Hess family, knew the business in Frankfurt. My cousin, Lynda Koester babysat for Herta’s children. Good Morning ! My name is Barbara Levy Lowy. I grew up in Manhattan on Central Park West. My father Kurt Levywas a dentist and my mom’s name was Ruth. We were members of Congregation Habonim with Rabbi Bernard Cohen,Reading these comments brings back memories that for years have laid dormant. I remember on weekend going uptown to B&F. We always had cervelat worst in the fridge. From reading all of the comments posted I am reminded of Rauf Fleisch , lentil and pea soup, leber kaesse (spelling?) marzipan, kartuffel salade .. All of theses memories are now flooding back! So thank you to all. I am so happy I found this site and look foward to the book and more memories to come! Thanks so much for your comment. We’re glad you found our site, too! Stay tuned for more blog posts and book news! My grandfather, Joe Florsheim, worked at Bloch and Falk. Some of my favorite childhood memories are of him taking me to the store where I was treated like royalty. I got to taste anything I wanted. I loved this store and the cervelat was second to none. Thank you for writing this article. It brought back many great memories and made me hungry! was the book ever published? Such fond memories….I loved the liverwurst. On my way to New Jersey I always tried to make a pit stop at Bloch and Falk. Herta would offer to make a sandwich for me. For the trip over the bridge she gave me a care package consisting of the ends of the wurst. Most of the time the wurst never made it home, I ate it in the car and thoroughly enjoyed it. We knew each other for a very long time. My aunt and uncle,Erna and Julius Hertz, as well as my grandmother, Louise Adler, lived at 651 west 171 Street. They always had wurst in the apartment when we came over on Sundays from Queens while I was a youngster. I only have wonderful memories of Herta and Alfred, they were mensches. saw ms. Bloch pretty often on the street since she and Ms. Falk lived in the CV complex where we live as well…so one day I got to schmoozing with her about my favorite thing my parents used to get which were the Lungenwurstchen (lung sausage) which were these white looking thick sausages which my father heated up in water with a tiny flame otherwise they would Platzt—they were drop dead delicious…so she tells me that this was the wrong way to prepare them and that he should have fried them in a pan….it made me feel ofal since it made me think about what I had missed out on….so I got her back for this and gave her some of my own eytzes and told her, you know ms. Bloch, look how Jewish this neighborhood is…you should have simply moved the store uptown to this neighborhood instead of leaving it at 174th street…so shes says, “Ronnie, next time I’ll dooooo it better”!!!! Yes, I have used that line as my own ever since….and I always footnote her as my sauce for it. A friend just sent me this blog–boy, does it bring back memories! I grew up in Washington Heights and remember my very frequent visits to B&F with my mother, grandmother, and great-grandmother. My father couldn’t wait for my mother to bring home the delectable aufschnit (sp?). My favorites were the tongue with pistachio, liverwurst, cervelat, bologna, and so much more! Everything was delicious! I’d love to get a copy of the recipe book, too, if that is anywhere in the works. Please let me know. I remember going to Block and Falk as a teenager. We lived in Brooklyn but had many relatives in the Heights. The cold cuts (aufschnit) were the best. My mother packed aufschnit sandwiches for me when I was in high school. What a treat. While the other kids were eating peanut butter and jelly sandwiches, I was eating these delicious cold cuts. How I miss those sandwiches! Living in the suburbs of Cleveland today, I have never found anything comparable. Try Schalller and Webber for delicious Calves Liverwurst and Teawurst. they have a new web site and they ship. They also have a retail store around east 86th street in Manhattan. Check out all their cold cuts on their web site. It’s a small world after all… My dad worked at A & N Pollak for many, many years, until he retired. He would get up around 5 in the morning, leave my brother and I the box scores from the previous night’s ballgames and sometimes not come home until 5 or 6 in the evening. Long, hard hours in the meat freezers, but boy were those wurst sandwiches delicious at midnight! Wow, great article. My dad was a butcher, also from Germany and he worked at A&N Pollack (near CCNY). We grew up on Ft. Washington Avenue and 176th Street, so Bloch and Falk was close by. It’s times like this that I wish my parents were alive, so I could ask them, “Did you know…?” Someone in an earlier reply mentioned Rauchfleisch (we pronounced it Ralph-fleisch) and I haven’t heard that word for like a million years. Once again, great article leading to fond memories. Growing up our family lived on Pollack products. Health was not a concern as we devoured Cervelatwurst, Liverwurst, Teawurst and Raufeish. I took a cervelat sandwich to school for lunch every day. When our own children were little they too loved the Cervelatwurst. We were all sad to see them close their doors. Until recenty Schaller & Weber made a reasonable facsimile but now they ruined it by adding whole peppercorns. Definitely not the German way. I can still remember from 40 years ago, my Oma buying cold cuts and wurst from this store. On holidays like Passover she always took orders for my mom & aunt. For me to remember such a store, from my childhood, 40+years ago, tells you what great products they made. I can’t find anything like that in NJ! The only place that makes kosher aufschnitt and cold cuts now is Wasserman and Lemberger in Baltimore. They also make liverwurst,biltong,jerky, and many other delicacies and is a full fledged strictly kosher butcher!